Lock in a great price for Spicers Balfour Hotel – rated 9.4 by recent guests! Room is cosy but with everything that we wanted and needed. Bed is extremely comfortable, great water pressure in the shower, very nice toiletries provided, good tea and coffee making facilities. Included breakfast is excellent value. All of the hotel, bar and restaurant staff were friendly, efficient and attended to our needs vestry well. Gorgeous accommodation in beautiful New Farm. Complete comfort. Definitely 5 star with a private patio, high end toiletries, furnishings and bedding. Excellent Asian fusion restaurant in premises. Great location with abundant choice of bars and restaurants. Close to CBD, 20 minutes to airport. Absolutely sensational staff from the GM and his team. Just awesome! Breakfasts were amazing. The bed was extremely comfortable! Stunning rooms. Highly recommend. Thank you! The honesty rooftop bar was lovely. The price of one shot of ginger liquor was a little steep at $15. Bed in Executive Queen suite was super comfy. Baggage storage was appreciated. Spicers Balfour Hotel This rating is a reflection of how the property compares to the industry standard when it comes to price, facilities and services available. It's based on a self-evaluation by the property. Use this rating to help choose your stay! 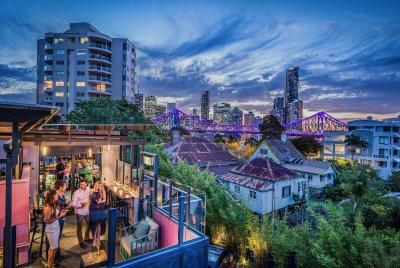 Located in the fashionable suburb of New Farm, Spicers Balfour Hotel is an award-winning boutique hotel just 7 minutes’ from the Brisbane city center. The luxurious rooms at Balfour Spicers include a flat-screen TV, DVD players, and a Nespresso coffee machine. Some suites offer 1940's style art-deco style décor with a separate lounge area. Spicers Balfour Hotel rooftop bar serves cocktails and overlooks the city and Story Bridge. The Balfour Kitchen is open from Tuesday to Saturday and serves Modern Vietnamese cuisine. Guests can enjoy breakfast or the famous Balfour high tea on the veranda or in the frangipani courtyard seven days a week. 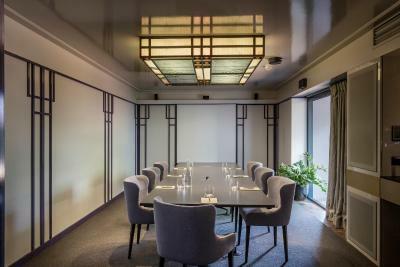 There is a private dining room, and a larger function room, available for celebrations or business events. 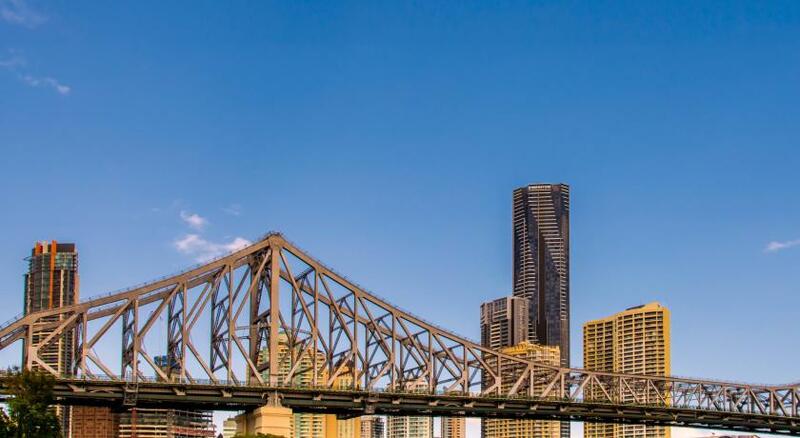 Spicers Balfour Hotel is approximately 30 minutes' drive from Brisbane Airport. 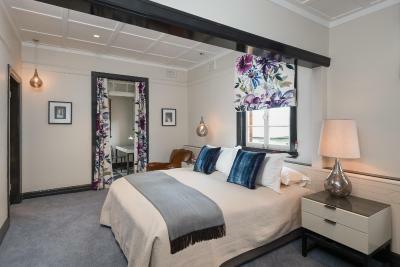 When would you like to stay at Spicers Balfour Hotel? 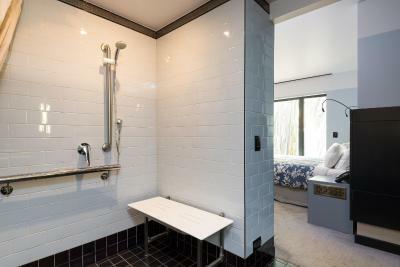 This room features an private bathroom with a rain shower. 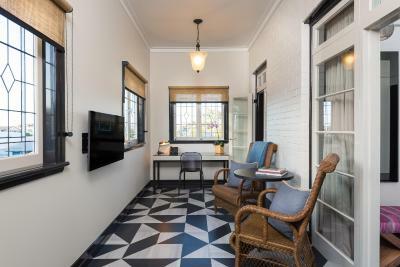 It features designer antique furniture, a Nespresso machine, air-conditioning, and a mini bar fridge. All rooms include parking and WiFi. 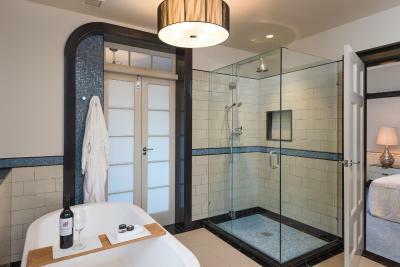 This larger room offers an private bathroom with a rain shower and a separate bath. It features designer antique furniture, a Nespresso machine, air-conditioning, and a mini bar fridge. All rooms include parking and WiFi. 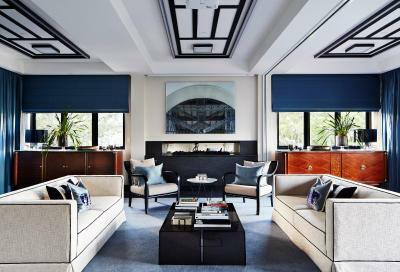 These luxury spacious suites offer 1940's art-deco style décor. It offers a bedroom, a separate sunroom, and an private bathroom with a rain shower and separate bath, heated towel racks, and mirrors. They offer premium bedding, an HD smart TV, 87 cable channels, an in-room safe, and a mini-bar. All rooms include parking and WiFi. This room features a queen bed with an accessible open plan ensuite. It features designer antique furniture, a Nespresso machine and air-conditioning. All rooms include parking and WiFi. 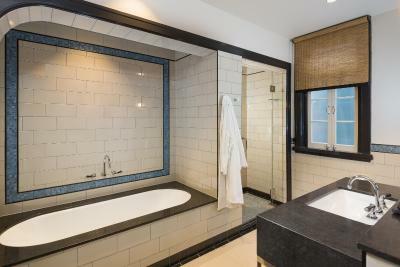 These luxury spacious suites offer 1940's art-deco style décor. It offers a bedroom, a separate sunroom, and an accessible private bathroom with a shower, heated towel racks, and mirrors. Hotel surroundings – This neighborhood is a great choice for travelers interested in friendly locals, riverside walks and relaxation – Check location Excellent location – show map Guests loved walking around the neighborhood! House Rules Spicers Balfour Hotel takes special requests – add in the next step! Spicers Balfour Hotel accepts these cards and reserves the right to temporarily hold an amount prior to arrival. Please inform Spicers Balfour Hotel of your expected arrival time in advance. You can use the Special Requests box when booking, or contact the property directly using the contact details in your confirmation. Excellent, we are regular Spicers visitors, always pleased. The lighting in the room was very poor. As soon as there was no daylight, the room was quite dark, even with all the available lights on. Being on a business trip, I needed to do a lot of reading at night and I struggled in the poor light. I was told the lighting was chosen that way to create a romantic atmosphere for couples. Given that the property has conferencing facilities, I would expect that business travellers would be welcomed too, and that their needs would be taken into account. The breakfast was good although the options were quite limited. I really enjoyed the location. We arrived a little ahead of 2pm bookings time and immediately made welcome and invited to wait in the comfort of the library whilst our room was prepared . Not only were we allowed earlier access but we were also upgraded to a suit .This generous gesture was very much appreciated and we loved staying in this beautifully renovated Art Deco building ( just down the road) Everything about the breakfast was perfect,the setting,table service and delicious interesting choices of food and drinks.We were not rushed at all which allowed us plenty of time to enjoy this special treat. Check out time of 1100 also welcomed . The room was small and poorly lit. Although it did not rain on us,the short walk from the suites in the annexe to the main building in a storm could be annoying! Staff were extremely helpful and courteous.Rooms were spacious and tastefully decorated. Breakfast and dinner excellent. Close to ferry for getting into city centre. Beautiful room with professional touches of luxury together with very friendly staff and excellent service, will be back in the future. Everything from the staff to the food to the accommodation was superb. I tried calling room service for dinner but the internal phone wasn't working. As I was already in my pj's and I couldn't be bother getting dressed to go to the restaurant for dinner, I had to have a snack from the mini bar in my room. A very cute and unique Bed and Breakfast. I was made to feel really relaxed and comfortable. The breakfast was delicious. We stayed in room 6 which was exposed to dining room noise which started early in the morning. Small discomfort negated by the comfort of the room. The staff were friendly and really helpful. Our bags were carried in for us which was very welcome. A lovely lady called Bonny showed us to our room. This kind of welcome gives such a positive start to a stay. The hotel had a relaxed colonial feel to it. The best bed and bedding ever...did not want to leave. We liked the later check out time which took pressure off us to hurry. The cleanliness of the bathroom was just okay. It was obvious the bathtub/sink had been cleaned but there was obvious dust accumulating on the shelving and around the door jams/skirting. 2 of the lightbulbs in the bathroom had blown. The pillows weren't to our liking. I couldn't see that there was a pillow menu and I guess for a 5 star hotel that should have been on offer to cater. The pillows were super large and way too firm. The windows had a fine layer of dust all over them internally and this was also evident in the hallways in the hotel itself. There was an awful rotten seafood smell permeating through the entrance and foyer. The staff were aware about it but seemed to fob it off. The breakfast was amazing! The staff in the restaurant were attentive and friendly. The bed itself was comfortable. Overall we did get a decent deal for the price we paid as it included breakfast. I have eaten here numerous times before but never stayed and the food never disappoints. Our room was at the front of the property and got quite a lot of noise from the kitchen and from diners in the restaurant. This wasn't a big deal except that we needed a fairly early night ourselves. The bed was extremely comfortable. The breakfast was superb - really interesting, tasty Asian inspired options, as well as the more common "big breakfast" style. The sunset views from the rooftop bar were great too. The best thing was you don't feel like you are staying in a hotel chain. The property has a uniquely tropical/Brisbane vibe to it. I would have liked an option for afternoon tea on our arrival day. Maybe fresh milk for tea in the fridge in our room.